We love reading books in this house. 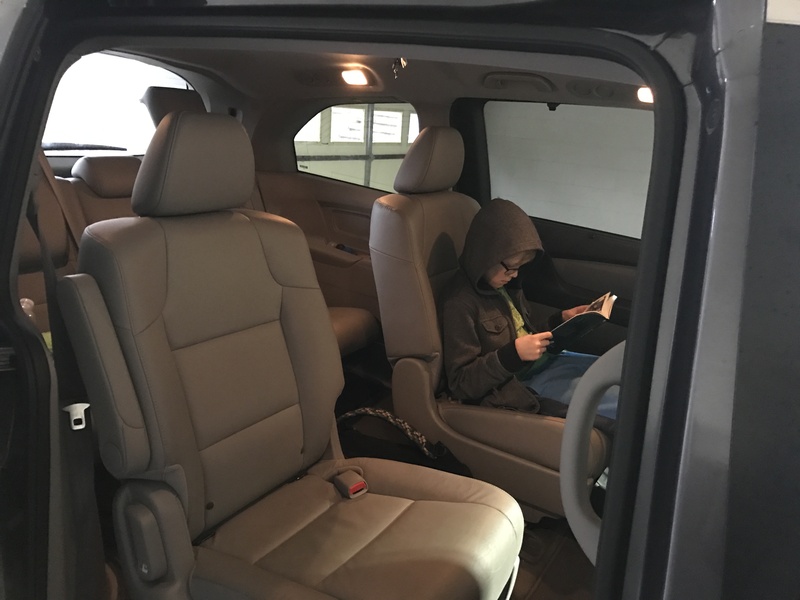 We also love reading books outside, on the bus, while we’re walking, and even in the parked minivan in the garage. The book that has captured the attention of this van reader is a graphic novel in the Amulet series. He got book 4 in his Scholastic order, and the older brother got book 5. They’ve both read both books in one day!! That’s the problem and the benefit with graphic novels, I guess. Easy to read, and too easy to read. 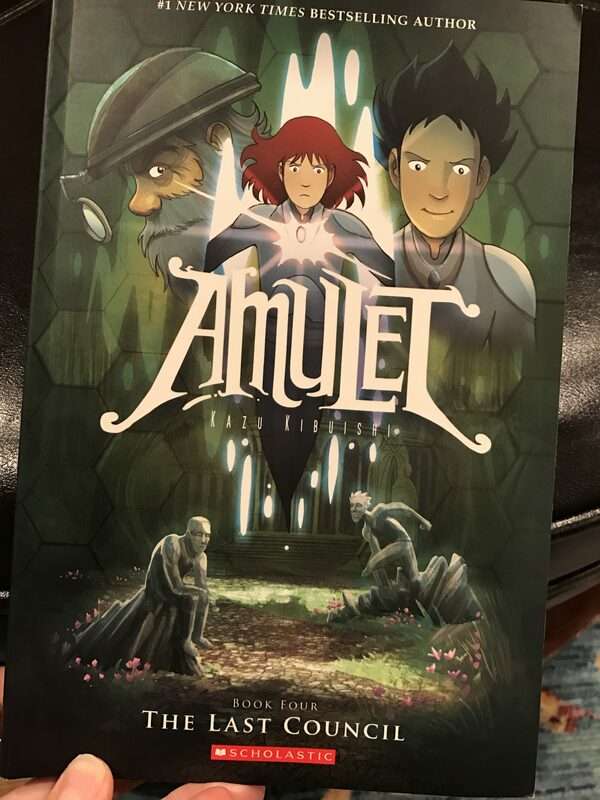 The kids are devouring these books, so if you’re looking for something that interests graders 4-6, get your hands on Amulet soon. Graphic novels are such a good transition from picture book to the meatier picture-free novel. But novels still work in read-aloud format, like picture books. I think that’s one big problem with graphic novels, they can’t be read aloud. Or, they can’t be read aloud and enjoyed like other books. And though my kids are all gaining very secure footholds in the reading world, picture books are still a source of enjoyment. 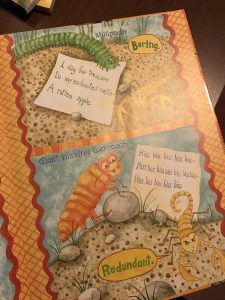 Recently, I cleaned out two shelves of picture books with my youngest and we had a chance to notice and comment on our favorites. I think Wild About Books might be my favorite picture book. The kids love it, but it’s so well-written I think adults love reading it, too. Well, bibliophilic adults do. 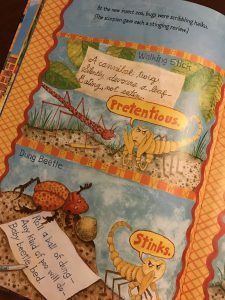 And my favorite part of the book is the insect zoo haiku part is my favorite part of favorites. The witty puns, the clever word choice, the clever insect choice! It all comes together so effortlessly that I am willing to bet she spent days working on this part. I feel a sort of familiar pain when the scorpion delivers the harsh, and sometimes true, critiques of the insect haikus. But to be a writer, one needs a thick skin…or chitin. I love reading this story aloud. It’s November and like many writers, I’m at the early stages of NaNoWriMo. I love NaNoWriMo because it helps me produce one big project, a 50,000 word novel in a specific period of time. But I’m not only writing novels. I write magazine articles throughout the year and try my hand at short stories here and there. But I also have a goal of writing a publishable picture book, fiction or non-fiction. To work on achieving that goal, I was really excited to learn about Julie Hedlund’s 12×12 project. This website encourages writers to produce 12 picture book drafts over the course of the year, one per month. The drafts do not have to be perfect and you don’t even have to show the draft to anyone (but I always take mine to critique groups). But for each draft you complete, you can earn a badge on your profile on the website. 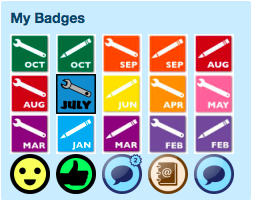 Writers can also earn a badge for revising a picture book manuscript in each month. I love the gamification aspect of this site. I also enjoy the forums as a place where writers can discuss questions and Shel SILVERstein members (my level) can also share the first 250 words of their manuscripts in the forums and request feedback from other members. For good karma, members are encouraged to leave feedback on two or three manuscripts for every one we submit for feedback. Gold members pay a higher fee and have the chance to submit their manuscripts to agents or editors. There is a bronze level that doesn’t allow you to post 250 words but does give you access to the forums and chance to participate in webinars. Thanks to 12×12, I’ve been really productive on my picture book manuscripts this year. I have a decent one I plan to bring to an intensive critique at my local SCWBI conference this month. I produced at least one throw away (The Snow Fort) and one possible magazine story (Santa’s Best Friend). I also revised a story that was purchased by a magazine and that feels like a great success! And for three months in a row I drafted completely different stories based on one basic idea. It doesn’t take long to produce a picture book draft. Mine are typically under 1000 words so that’s less than an hour of work a month! Get those vague ideas into words and see how they feel. Then for the rest of the month massage the words, revise the words, adjust and alter the words. If it’s not feeling great, let it go at the end of the month because you know you will produce something new. I’m thinking I will renew my membership next year because I like the accountability that comes with knowing I’ve paid for a membership and I should use it. It’s interesting that I don’t have a lot of trouble generating queries for non-fiction magazine articles. But there’s usually a deadline associated with non-fiction query ideas, so that is my accountability! What helps you be productive when it comes to picture book writing? Do you set goals and work to fulfill them? Do you need some kind of external structure to keep you focused?